Let me start by saying, if you don’t already love ABBA you definitely will after this film. 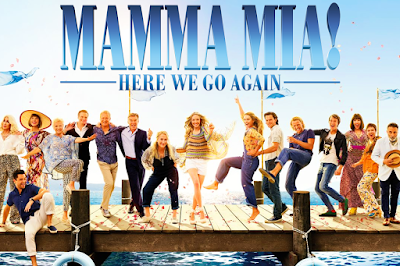 Set five years after the first film, Mamma Mia! Here We Go Again sees daughter Sophie prepare for the reopening of Hotel Bella Donna. As she rushes to get the hotel ready, we’re taken back in time to the late 70’s to see how Donna met Sophie’s three potential fathers. Lily James plays the role of Young Donna as she leaves her ‘dynamos’ behind to go travelling. Along the way we get to meet Young Harry, Young Bill and Young Sam, all of which captured my heart in very different ways. Donna begins her journey in Paris, where she meets exceptionally awkward Harry and they share an equally awkward (but adorable) night together. But, she soon realises that Paris is not the place for her and sets out to Greece. On her travels, she meets Young Bill who was actually my favourite potential father (possibly because he owns a boat). He takes her all the way to Greece and from there we are introduced to the picturesque island that we became so familiar with in the first film. Unfortunately, (for me), young Bill leaves Donna to settle in and she soon meets the final potential father, Sam. However, their relationship doesn’t blossom quite as Donna would hope and yet again we are left not knowing who the father is. The ‘young’ cast in this film were absolutely amazing at capturing the characters that were established in the original Mamma Mia, I’d actually go as far to say that I preferred them. They certainly added a whole new charm and life to the Mamma Mia franchise. The film constantly transitions back and forth between the 70s and the present day. During these scenes we really get to see the similarities between Sophie and Donna which, I must admit, is exceptionally heart-warming (I may, or may not, have cried). Just like the first film, Amanda Seyfried and Meryl Streep are an incredible mother-daughter duo and when ‘grandmother’ Cher is thrown into the mix, things just get taken to the next level. Not to mention of course, the entire film is set to an all-ABBA soundtrack. What I love most about these films is that the songs don’t feel forced, each scene is set perfectly to the soundtrack and completed with an over the top dance routine. Why can’t real life be set to ABBA songs? I think it’s fair to say that the Mamma Mia films have turned me ABBA crazy and I’m not mad about it, I’m even contemplating buying some flares. Overall, this is an absolutely cracking film that literally had me both in tears and dancing in my seat all within a matter of minutes.